Three potential 2012 presidential candidates spoke at a statehouse rally, praising the home-schooling parents and their children who are spending the day in Des Moines. Home-schooling families played a role in former Arkansas Governor Mike Huckabee’s Iowa Caucus win back in 2008. The three politicians who may be running for president in 2012 stressed not only their support of families who teach their children at home, but their hostility to the public school bureaucracy. 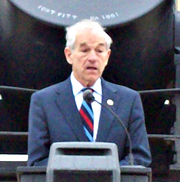 Texas Congressman Ron Paul told the crowd government wants “absolute control” of the “indoctrination” of children. Michele Bachmann speaks at the Home School rally. Minnesota Congresswoman Michele Bachmann said home schooling is the “essence” of freedom and liberty. “It’s about knowing our children better than the state knows our children,” she said. 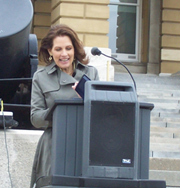 Bachmann, who home-schooled her five biological children, lamented that she and her husband had been unable to teach the 23 foster children who have lived in their home because Minnesota authorities said foster children could not be home-schooled. Herman Cain, former C.E.O. of Godfather’s Pizza, was the other prospective G-O-P candidate to speak, denouncing government involvement in education at all levels, including the United Nations. “That’s all we want is for government to get out of the way so we can educate ourselves and our children the old-fashioned way,” Cain said. Justin LaVan of the Network of Iowa Christian Home Educators said it was encouraging to see potential presidential candidates talking about the home-schooling movement. “More importantly, talking about our Creator — our rights that came from our Creator, acknowledging that and giving him the glory, folks,” said LaVan, who served as master of ceremonies at the rally. According to LaVan, about 1000 Iowans who’re part of the home-schooling network made the trek to Des Moines today to tour the state capitol. Many attended the outdoor rally, as well as an afternoon seminar at a nearby hotel where all three of the prospective candidates spoke as well. Listen to the three speeches at the rally.